Former White House press secretary Josh Earnest is speaking for the first time about how his successor Sean Spicer is doing. Earnest says he's rooting for Spicer "to succeed," but he doesn't "feel a ton of sympathy" for the new press secretary. Spicer's first three months in the job have been marred by missteps, misstatements and controversies. Many reporters and observers have expressed concerns about his credibility. But Spicer has hung on despite all the whispering around Washington that he wouldn't last long in the job. Over the weekend The Washington Post quoted a source who recalled President Trump saying, "I'm not firing Sean Spicer. That guy gets great ratings. Everyone tunes in." "Everyone," it turns out, includes Spicer's predecessor. 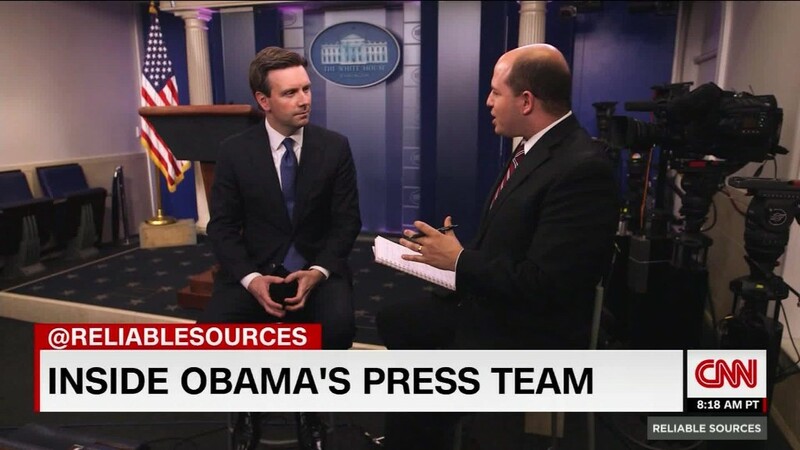 Earnest was the White House press secretary for the last two and a half years of the Obama administration. He spoke on Sunday at a George Washington University event moderated by CNN's Dana Bash. Earnest said Spicer has the same job title but a "very different set of responsibilities." Both jobs entailed communicating with the public through White House press briefings, but "Sean's job is different because he works for somebody who is famously thin-skinned and somebody who has demonstrated over and over again that he doesn't care that much about telling the truth," Earnest said. "And who, at least in some of his record, doesn't appear to have much of an appreciation for how important independent journalism is in the success to our democracy. That's what makes our approaches so different." Earnest went on to say that he doesn't have a "ton of sympathy" because "Sean's not the victim of a bait and switch. It's not like he met President Trump on his first day. It's not as if Sean met President Trump on Sean's first day of the White House. Sean worked for the Trump campaign and the RNC and the transition. He knew what he was getting into." But Earnest said he's rooting for Spicer to succeed in "educating the American public about what's happening to the White House." He did express some sympathy for Spicer on the subject of anonymous criticism by White House colleagues. "There have been number of times where Sean has been the center of some firestorm -- where within 24 hours there are anonymous White House officials criticizing him," Earnest said. "The job of being the White House press secretary is hard enough without having people that are supposed to be on your team criticizing you and undermining you in public," he said. "And I was very fortunate to be on a team of people that hung close together." Earnest recently joined NBC News and MSNBC as a political analyst. While he has discussed Trump's time in office, he has mostly steered clear of critiquing his successor. One exception: when Spicer's January 21 lecture to the press about inauguration crowd size came up recently on MSNBC's "Morning Joe," Earnest said, "I wouldn't work for a president who would ask me to do that." Spicer's outburst that day, full of falsehoods and misleading assertions, "has impaired their ability to advance their agenda," Earnest said.